Rather than focus on the speech or writing practices of bilingual individuals, however, participants in EALANG 84, “Reading the Multilingual City” have made several field trips outside the seminar room and into local neighborhoods and business districts, where they have attempted to read the city itself as text. 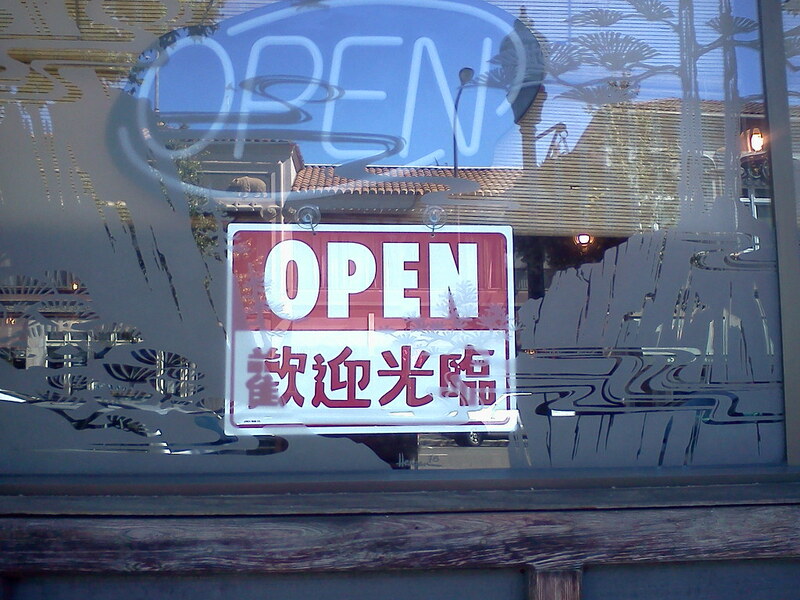 On the streets of downtown Berkeley, Albany, north Oakland and beyond, they have observed, recorded and discussed the significance of Chinese, Korean, Japanese, and Tibetan as they appear with English, Spanish, Amharic, and numerous other languages on signs in public view. Now, for their final projects, they are examining reactions to local business signs in Chinese by people who don’t read Chinese; exploring the dominance of English with a visual experiment that makes Spanish the public language of choice; documenting the identity of restaurants through a combination of exterior and interior elements; comparing the storefront self-presentation strategies of two multinational clothing companies; and mapping boundaries of dialect, lifestyle, and tourism in San Francisco’s Chinatown. As may or may not be obvious in my semi-formal prose here, I’m pretty excited about this class. I think the linguistically rich and politically loaded domain of visible multilingualism in public has much to offer for students of applied language studies and heritage/foreign languages alike; I feel that the methods that a class like this employs—placing students in the role of investigators both inside and outside the classroom—opens the door to dialog with practitioners of community-based, engaged scholarship initiatives; and I, like numerous others who have identified with the evolving sociolinguistics field of linguistic landscape, have thought for a while that the field could benefit conceptually and methodologically from more pedagogical application. As is likely obvious by now, though, I’m not a neutral observer in this process. I was lucky enough to have been able to design and teach this class as something of an experiment, just as many of the Freshman & Sophomore Seminars are of an experimental nature. And though I’m sure the class has benefited from its emergent qualities, small scale, and general sense of newness, it has also, I’m sure, contained many gaps in content and process, while giving rise to many (many!) unanswered pedagogical questions. So, while today I congratulate the group of sophomores in EALANG 84 for their work, and thank them for helping to chart this new territory with me, I’d like to use this post as an occasion to look forward to several others that will, over the next month or so, explore how to teach, and how to learn meaningfully, in the linguistic landscape.